About a year ago my scalp suddenly became really dry, itchy and flaky, a bit like dandruff. It was another part of my eczema and I wasn’t happy about it. At the time I was using Herbal Essence shampoo and conditioner. I had been using this brand for at least 3 years so was confused as to why my scalp was suddenly reacting to it. Not wanting to go to the doctors for even more creams I did a little bit of Google searching, information about sodium lauryl sulphate was the most common thing to come up in the search. Previously I had no idea about what goes into the products we use but now have gained a lot more knowledge. As others have had the same reaction to me and solved the problem by cutting out all the nasty ingredients like SLS I decided to follow course. After trailing many different “good for you” shampoo and conditioners these two are my favourite and one’s that I will always come back to. 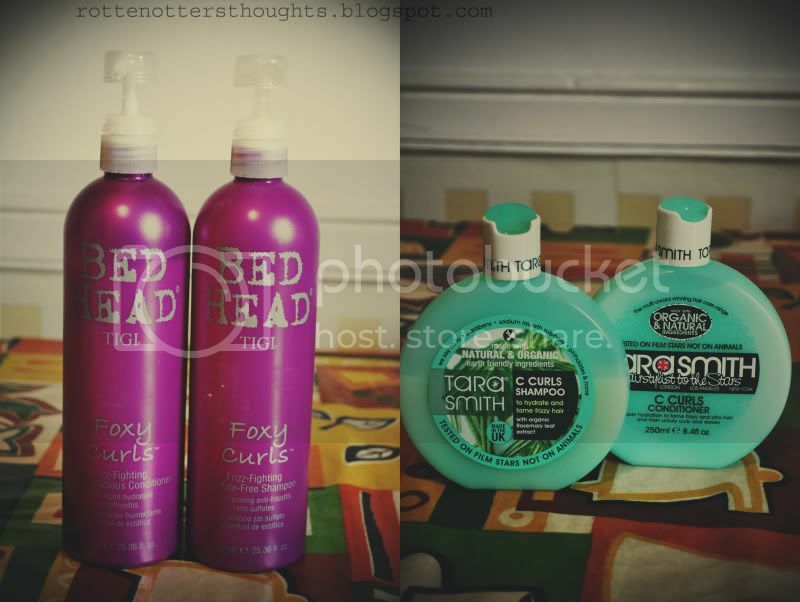 Both of these shampoos lather up really well and the conditioners leave your hair silky soft. They both smell amazing! Bed head can be found in TKMaxx for about £14, for 750ml for two bottles, such a bargain! Tara Smith can only be found online now, I buy mine from Bodycare2000.co.uk. These are a bit more expensive at £4.99 for 250ml each. Just a few tips I've found useful to help with my sensitive scalp. Even though I'm using better hair products I still wash my hair with my head over the bath tub using the shower to stop any product going on my body. Try to wash your hair less, my hair allows me to only have to wash it once a week and my scalp is much better because of it. My dry and itchy scalp still comes up every once and a while especially when I’m stressed but no where near what it was like this time last year. If you suffer from any of these annoyances try switching to SLS free products and it may be a life saver! I also have a itchy flaky scalp but haven't been impressed with sls shampoos I've tried so far, but I think I will give the tigi ones a go, thanks for this post! I had similar experiences with the SLS in the Herbal Essences! I used it for years. 5 weeks now free from SLS and my hair is better. I encourage everyone to read the labels! I really want to try some bedhead products, they sound lovely. I'm using the Organix range at the moment and it's lovely.